Update: Connect Route to 500+ apps with Zapier! When Route started we wanted to make a Marketing Automation tool that would be open to connect with different applications. We never thought about making Route the center of all marketing and sales activity of a company. We could do that. Other tools do that. But we believed (and still believe) that we need to focus on creating a powerful solution for automated marketing and sales tasks, leaving other common elements of marketing automation like CRM, Landing Pages, Form Builders and so on, on the hands of companies we know they do a great job. That’s why being on Zapier is part of what we believe as a company. We love Zapier. We use Zapier ourselves. It’s the kind of service that allows a non-technical marketing professional like me powerful. I can connect different apps to become more productive, to create better content marketing, to be more efficient in dealing with Route leads and to send more powerful marketing automation campaigns. And all of that without spending a lot of time working with developers and engineers to create custom integration and code for every application I want to connect Route with. Every marketer knows that collecting leads is important and required when thinking about using Marketing Automation to create engagement. Lead Nurturing depends on Lead Generation. One of the most popular apps to help companies to generate leads is SumoMe. Use this Zap to start sending your SumoMe leads to Route. 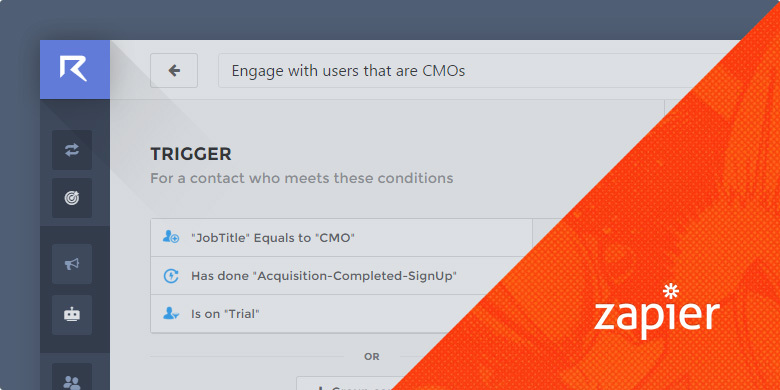 Zapier recently launched the multi-steps zaps that allow the user to create a workflow with more than 2 apps. This SumoMe + Route integration can become more powerful using Code by Zapier. Sometimes leads are more qualified when they use their business email. It’s nice being able to segment them automatically. Keeping all databases up to date is quite hard. When you start using different applications and places where you store your data sometimes it can get messy and you end up not knowing exactly which one is more accurate. Well, if you use SQL Server as your main database you can send information to Route and from Route to your database easily. Just use SQL Server + Route and Route + SQL Server to make the magic happen. This is one case where Zapier adds more functionality to Route. One that we know its important and we will develop a native alternative, but that right now is not on our next Product sprints. One of our users needed to send to all subscribers an email exactly 7 days before an event to take place on a specific date. People could subscribe to participate in this event along the week so this user needed a solution like Delay by Zapier. So, the user created a multi-step Zap with Route + Delay by Zapier + Route again to trigger the campaign. Slack is the team communication tool everyone loves. Including us here at Route. Keeping track of leads the convert as trial is important so we can take action and contact them if needed. We do a lot of things automatically, but everyone in the start-up world knows that somethings only work when done manually. With this integration you can send a notification to your Slack every time you capture a new contact. I just listed a few examples with different ways to connect Route to other apps. But for more traditional integrations you can connect Route to CRMs, Form Builders, Surveys and, well, with Zapier and its 500+ apps the possibilities are endless. Have a Route and a Zapier account? Just login on both accounts and start creating your Zaps. Don’t have an account on Route or Zapier? Signup to a Route account and to a Zapier account now. ← Cross-domain tracking, Anonymous events and more!